Offerman expands his acting muscles with this role, showing many different sides to his guilt-ridden father character. Supporting him is rising star Kiersey Clemons, who believably handles both a vulnerable teenager and confident singer/songwriter. Their relationship is typical of the leaving-the-nest elements that parents and teens endure, but their connection as songwriters make the relationship unique. 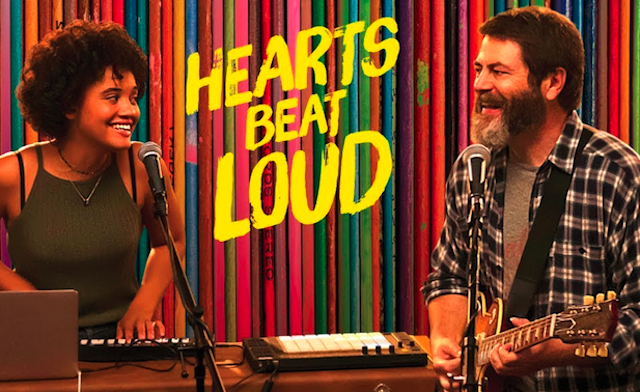 Toni Collette, fresh off her sensational “Hereditary,” is Offerman’s landlady and maybe love interest, and Ted Danson goes back to some performance roots as a bartender, who is Offerman’s best friend and advisor in the film. Brett Haley writes (with Marc Basch) and directs stories of the human condition, and has a penchant for using older actors as leads in his films, such as Sam Elliott in “The Hero” and Blythe Danner in “I’ll See You in My Dreams.” He also makes surprising cast choices, with Martin Starr (“Silicon Valley”) portraying a character opposite to his persona in “…Dreams,” Laura Prepon (“That ‘70s Show”) as a stand-up comic in “The Hero,” and of course, putting Ted Danson back behind the bar. As Brett Haley mentions in the interview below he has created “hundreds of short films and 15 features,” but his most prominent short film debut was “The Life and Death of Jimmy Katz” (2005), and his first major feature was “The New Year.” (2010). In the following podtalk with Patrick McDonald of HollywoodChicago.com, Brett Haley reflects on his process in creating stories, his admiration for Nick Offerman and his director influences in the cinematic universe.